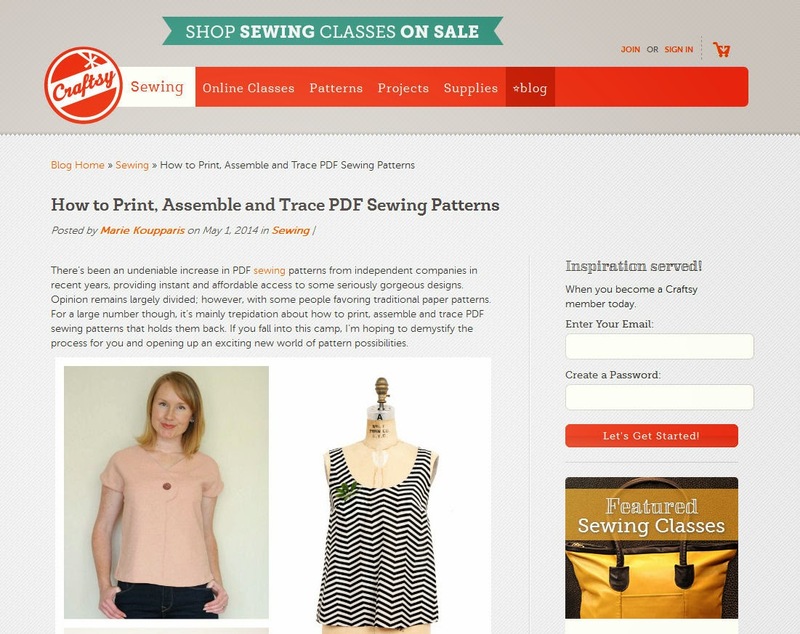 Do you feel you're missing out on instant and affordable access to gorgeous sewing patterns because you're wary of using PDFs? No need to let that trepidation hold you back any longer, because my latest Craftsy post walks you through how to print, assemble and trace PDF sewing patterns. I've even included my top picks for simple blouse patterns to get you started. Thank you so much for describing the tracing method. I read about people doing it but no one ever said how they do it. This is a game changer for me! So glad you've found it helpful! Thanks Marie. I'd never thought about tracing the pdf pieces - any advice on storing? Are they best rolled once traced or folded again. My teeny tiny home office is in chaos with patterns lying everywhere because I'm scared of breaking the paper seams on the pdf patterns. Any ideas much appreciated thanks. I have been wondering the same thing... I trace my pdf patterns as well because the taped together paper just doesn't work as well for cutting out, but I never know what to do with the paper. If it's a smaller pattern I store it but it gets harder to reuse when it's been folded up, and tossing it out seems like such a waste! Hmmm, excellent question! I only trace when I *have* to and normally just cut out my pattern pieces as I'm too lazy. So I just fold the pattern pieces up and store them in plastic A4 sleeves in a folder. If you were to try and store the entire sheet with all the pattern pieces on it, I would suggest sticking them securely/well with cellotape and then folding as small as possible so you could store in a plastic sleeve or envelope or similar. I might ask this question on Twitter and feedback with any better suggestions! I put the pattern piece folded up in a gallon size Ziploc bags. I stored the Ziploc bags in a box that I purchased from Ikea. The pattern instructions I keep in a magazine file. I am thinking about moving the instructions over to a binder. I only have a few PDFs so my system might not work if there were loads of them to store, but if the pattern pieces are generally big, then I roll them all up together like a poster, secure with a elastic and stand it up on a shelf in one roll. By rolling the next pattern up looser or tighter, I can sit the patterns inside each other without them getting mixed up. For smaller patterns, I paperclip the bits together and fold the whole thing in half and store under my regular patterns in a drawer. I don't really like folding them though as the office paper I use is kind of thick and the folds don't really come out.